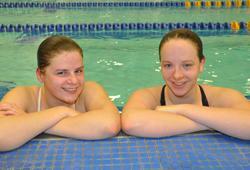 Sophomores Mackenzie Bradley and Emma Reim are both are competitors on the Smith swim team as well as training partners. The pair’s love of swimming will be put to the test next August when they set out to swim across the English Channel. Yes, that English Channel: 21 miles across the Strait of Dover, from Dover, England, to Calais, France. Twelve hours of straight swimming in choppy, 60-degree water, through one of the busiest shipping lanes in the world. Read the full story on The Gate.